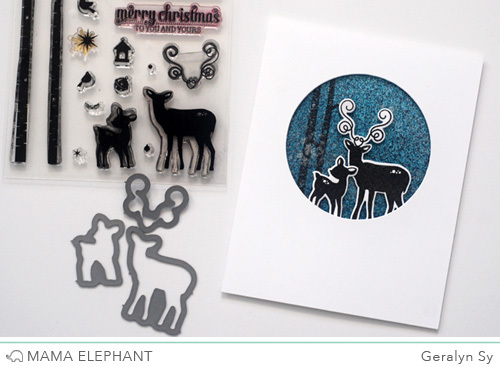 mama elephant | design blog: Winter Wonderland Creative Cuts with Geralyn! 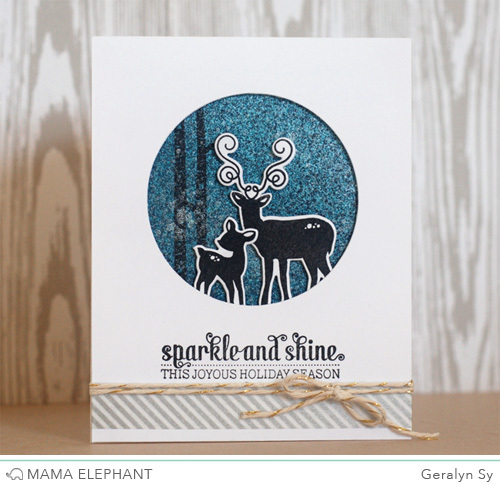 Winter Wonderland Creative Cuts with Geralyn! Hi everyone! 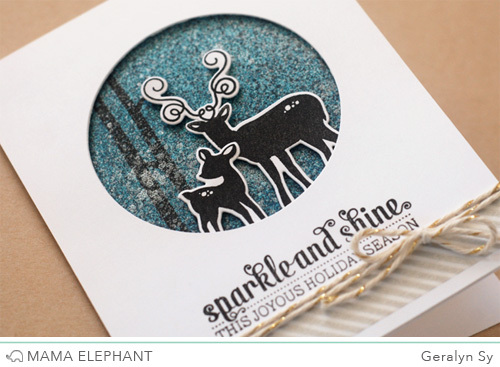 Geralyn here today to share with you a project using the new Winter Wonderland Creative Cuts! 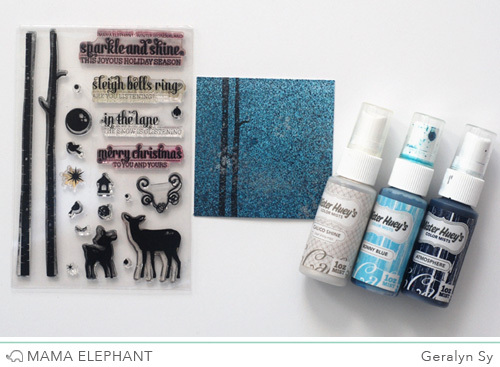 The Winter Wonderland stamp set was one of my favorites last year and I'm so glad Mama Elephant released coordinating dies for this set. I started by misting a 3x3" piece of cardstock with various spray mists. Then I stamped two of the birch trees from Winter Wonderland on the cardstock, and added a spritz of Mister Huey Shine to give the cardstock some shimmer. 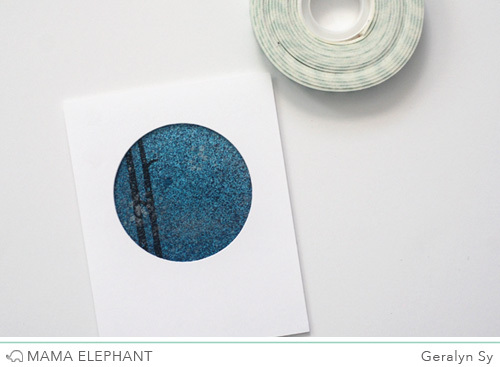 I created a circle negative on a 4.25x5.5" piece of cardstock and adhered my misted cardstock underneath it with foam adhesive to frame my wintry scene. I stamped my Winter Wonderland deer and cut them out using the coordinating Creative Cuts, then adhered them with foam adhesive inside my circle. To finish it off, I stamped a sentiment, added a strip of washi tape, and tied some glitter baker's twine around the cardstock before adhering it to a standard size card base. Here is my completed card! I love how easy it was to make the deer stand out by cutting them out with the Creative Cuts and giving them the white outline. JUst beautiful. OMGosh. Love the stamp/dies. Hope we see more of those no matter who makes. Such a lovely card! Love the beautiful background! 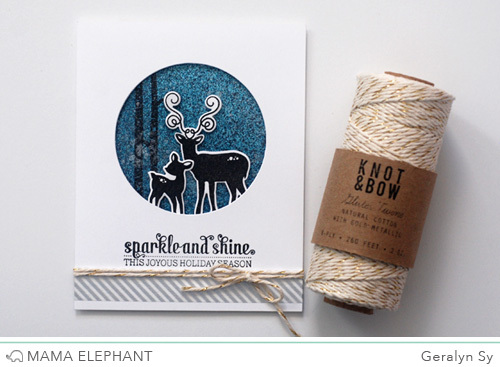 Love Geralyn's misty background and deer die cuts.